If you’re new to Windows 10, you’ll find your files opening in new programs that you’re not familiar with yet. But the cool thing is you can change them. Windows 7 users who skipped Windows 8.1 and are now on Windows 10 might not be happy with certain files opening in universal apps by default. If that is where you’re at, no worries, you can have files open in whatever app you want. 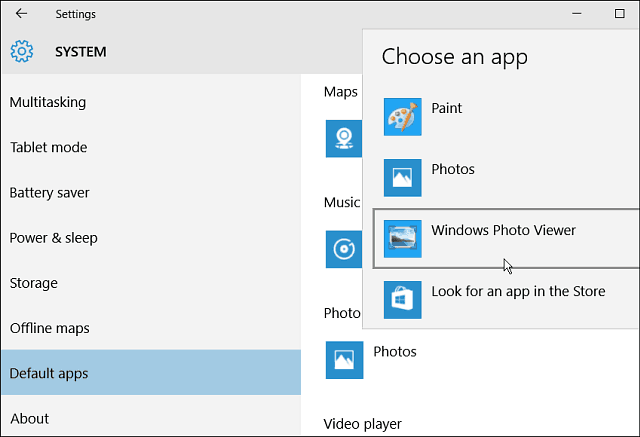 While I find the Photos app in Windows 10 to be intuitive, you might want your pics opening in something else, like Windows Photo Viewer for example. 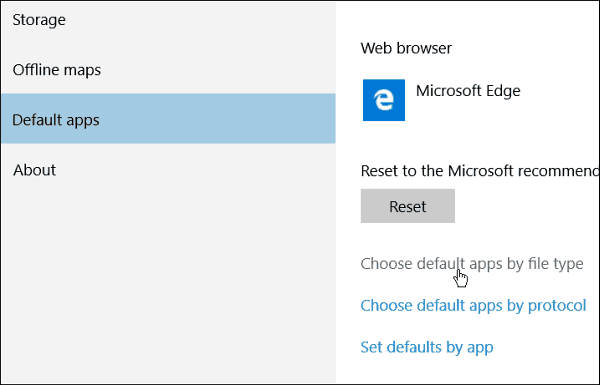 To change the default program for files, open Settings and go System > Default apps. There you’ll see which apps are set to open your files by default. Select the files type you want to change, in this case photos, and from the menu, choose the app you want photos to open with. You also have the option to find another app in the Store. Another option you have is drilling down each file type. Maybe you don’t want all photos or music opening in one specific app. So scroll down a bit and select Choose default apps by file type. Then you will get a huge list of file types and the apps that are associated with them. Just go through the list and change each file type to what you want. 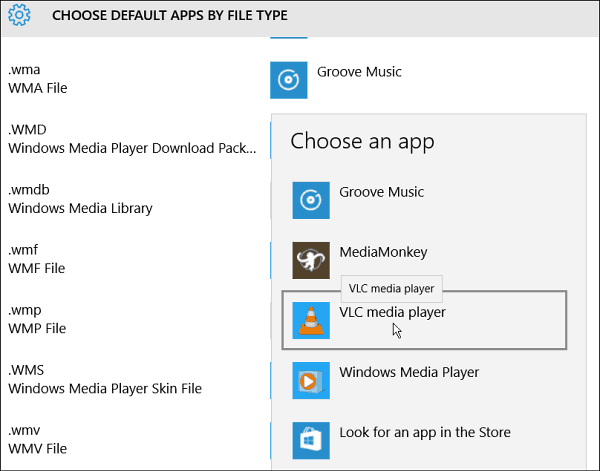 For example, in the shot below I am changing WMA files to open in VLC instead of Groove Music (which is the name of the default music player in Windows 10). If you don’t want to go through the tedious process of changing each individual file type, you can just change the associations as you move along. Right-click the file, select Open with, and then choose the program you want. If you’re new to Windows 10, you’ll find your files opening in new programs that you’re not familiar with yet. But the cool thing is you can change them to what you want. You can do this in other versions of Windows, too. One more thing to note, at least in Windows 10, your files won’t be opening a crazy full screen app like in Windows 8, they open in nice floating windows on the desktop instead. Below is an example of Groove Music and the Photos app on the desktop. Speaking of the new universal apps in Windows 10, let us know what you think about them in the comments below. 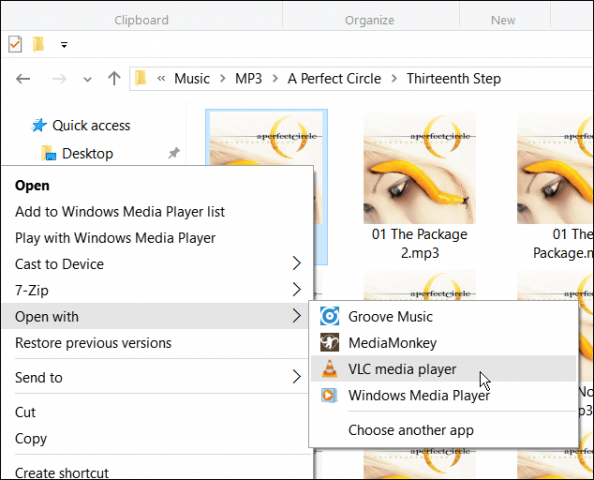 I would like to still be able to use the windows 8.1 media player benefits in windows 10 and knowing that i will lose this i will not go to windows 10.